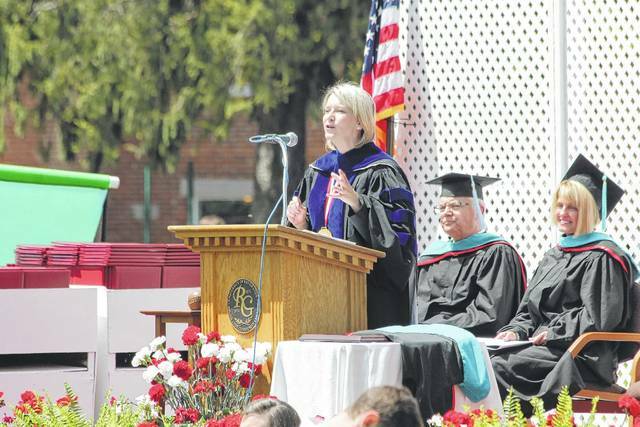 University of Rio Grande and Rio Grande Community College President Dr. Michelle Johnston speaks to graduates during the 139th commencement ceremony in 2015. RIO GRANDE — According to a release published on the University System of Georgia website, Dr. Michelle Johnston has recently been selected as the sole finalist for a president’s position at the College of Coastal Georgia in Brunswick, Ga.
Johnston is the 22nd president of the University of Rio Grande and Rio Grande Community College and took the Rio president’s seat in 2014. Johnston was appointed by Gov. John Kasich to serve as a member of the Association of Ohio Commodores. She serves on the Welsh Heritage Museum Board and was appointed by the U.S. Secretary of Defense to the Marine Corps University in Quantico, Va., and also serves as its chair, according to the release. The release states a board of regents will decide on a finalist for president at the College of Coastal Georgia during a future meeting. Ohio Valley Publishing will continue to follow this story as it develops.